Give a disadvantaged youth a summer job, and he or she will be much less likely to commit a violent crime. That's the conclusion from a randomized controlled trial just published to the journal Science. University of Pennsylvania criminologist Sara Heller oversaw the study, which took place in 13 high-violence schools in areas of Chicago. 1,634 students participated in the summer of 2012. Almost all of them were minorities, and more than 90% were on free or reduced lunch. 350 students were randomly assigned to 25-hour per week summer jobs, another 350 were given 15-hour per week jobs along with 10 hours of social-emotional learning classes "aimed at teaching youth to understand and manage the aspects of their thoughts, emotions, and behavior that might interfere with employment," and the remaining students carried on with their lives as normal. Jobs were paid at the Illinois minimum wage and lasted 8 weeks. Importantly, Heller found that the largest decreases in violent crime rates came months after the jobs program ended, meaning that it wasn't specifically being in the program that prevented crime; the experience may have engendered lasting behavioral change. 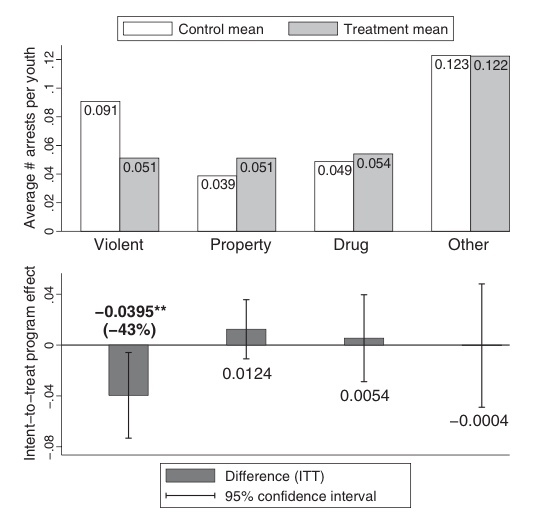 There was little difference in effect size between the two treatment groups -- either the job-alone or the job plus classes -- which indicates that the classes weren't the sole reason for the reduction in violent crime. So what was? In societal studies like these, the answer is very open to interpretation. "The experimental design cannot tease out which program element or elements generate the decrease in violence," Heller admitted. Youth employment programs have been studied in the past with mixed results. Most of the time, the program costs seem to outweigh the societal benefit. In this case, the program cost an estimated $3,000 per student ($1,400 for wages and $1,600 for administrative costs) while yielding around $1,700 in benefits from reduced crime. So the benefits did barely outweigh the administrative costs. However, Heller insists that preventative programs like these are still more cost-effective than remediative punishment like prison. "The results echo a common conclusion in education and health research: that public programs might do more with less by shifting from remediation to prevention. The findings make clear that such programs need not be hugely costly to improve outcomes for disadvantaged youth; well-targeted, low-cost employment policies can make a substantial difference, even for a problem as destructive and complex as youth violence."